Following his superb ‘The Holy Terror,’ writer Rob Shearman returns to the Big Finish range with ‘The Chimes of Midnight,’ an Eighth Doctor tale featuring a mystery within an Edwardian manor that on the surface seems to be deserted despite many signs of being occupied. Right from the start, ‘The Chimes of Midnight’ establishes its creepy tone, and the purposefully misleading script full of fantastic visuals maintains the excellent mystery and intrigue. As Charley and the Doctor become separated and unable to interact, the script does a very good job in introducing the staff of the manor as they prepare for Christmas, and the subtle clues placed throughout the story hinting at another force in play slowly start to become more meaningful as events continue to unfold. It’s not until the Doctor realizes the severity of the situation as he has been allowed to enter the stream of events that the pervading sense of peril truly manifests, though. There is still some humour to be found underlying the impending danger, however it’s often of a much darker nature than in previous releases, fitting in tone with the bizarre proceedings of this unique murder mystery seamlessly. What follows is an intelligent tale that demands the attention of its audience, but the payoff for the changing events and perceptions is immense. ‘The Chimes of Midnight’ takes place on a smaller scale than most stories, and this affords Shearman ample opportunity to explore all of the main characters while giving Charley her most pivotal role yet, a chance that India Fisher takes full advantage of from the start. The cause of the mysterious events and deaths remains shrouded for much of the play, giving the threat a more ominous and subtle tone than in many stories, and the effects on the characters are very grounded while also profound. The quality of acting from every single supporting actor is absolutely pitch perfect, a testament to the quality of the script and of Big Finish’s casting. Lennox Greaves’s butler Shaughnessy demanding perfection from his staff and believing himself to be the piece that makes everything go, Sue Wallace’s cook Mrs Batteley dedicating herself to her tasks and her plum pudding, and Louise Rolfe’s scullery maid Edith surprising in her importance after being sneered at so openly are all standout roles and performances. In particular, Edith’s scenes with Charley are easily some of the most heartfelt and convincing in the story, though the Doctor’s scenes with Charley at both the beginning and end show just how invested in each other the two leads are as well. The atmosphere evoked throughout the tale, beginning with music box tones and ticking clocks that become quicker and more sinister, is without a doubt the most mesmerising and convincing of this range so far, making the house another character in itself even before the mystery truly starts to present itself. Along with the typically strong production values, Russell Stone’s score greatly complements the events to add a sense of increasing dread and terror that crescendos at just the right points. 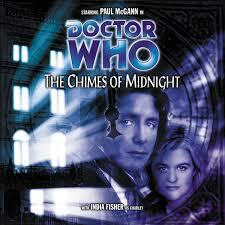 It’s rare that every facet of a production comes together so flawlessly, but ‘The Chimes of Midnight’ is one of those circumstances where there is no weak point, further cemented by Paul McGann’s always superb performance as the Eighth Doctor. This is one of those stories where spoilers need to be avoided at all costs beforehand, not because knowing how events play out ruins the story or effect, but because piecing together the puzzle and discovering the cause is so deeply satisfying. The ultimate revelation about the cause of the events is a strange one, and one that easily could have become too confusing or fallen flat if presented any other way, but Shearman’s script does a fantastic job in explaining just why everything happens as it does, making for a very meaningful ending to a great and very ominous holiday tale. This is the strongest Eighth Doctor story to date and an instant Big Finish classic.